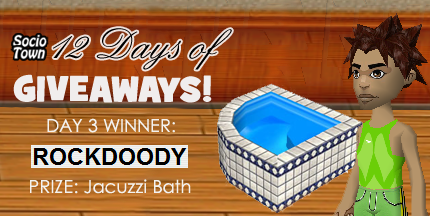 12 Days of Giveaways Day 2 & 3 Winners: Suzan45 & Rockdoody! Congratulations to our Day 2 and Day 3 Winners: Suzan45 and Rockdoody! 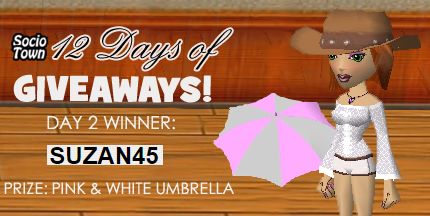 Suzan45 gets the umbrella collectible, the Pink & White Umbrella. Rockdoody, on the other hand, gets the essential and must-have Jacuzzi Bath. We’ll be picking our next winner in a couple of hours. Who do you think will win for Day 4 (December 24)? This entry was posted on Wednesday, December 24th, 2014 at 2:22 pm	and is filed under Events. You can follow any responses to this entry through the RSS 2.0 feed. You can leave a response, or trackback from your own site. You are welcome, Suzan45! Congratulations again!